I have a confession to make. I resist the urge to buy glass insulators every time I see them. This was not really a problem when I lived in Los Angeles, but living in the great state of Wisconsin there is too much temptation. For those that do not know: glass insulators were first produced in the 1850's for use with telegraph lines. By the mid 1960's a few people started to see them as collector item. Some people have vast collections (my research has found over 3,000 people collection them). There are event insulator & bottle shows around the Midwest. They came in a variety of shapes, sizes, and colors. Though, I am particularly drawn to the green ones. So, what would I do with glass insulators, you ask? Well, I've started to look around to justify my whim. Now, a person can buy lights and such already made, but what is the fun in that. Or, like my neighbors you can set them around your yard like garden gnomes. Here are some ideas that range from effortless to major DIY. Pair with electric candles for mood lighting. Photo courtesy of Hernando House. They make a beautiful coatrack. Photo & Project courtesy of Creatively Living. Yes, you can have insulators setting around as decor, but you can also pair them up with other vintage items to create unique and beautiful piece. For instance over at Natalme, I found this pairing of glass insulators with a vintage chicken feeder. It makes a wonderful mantel display. Insulator lighting goes for a pretty penny online, but you can actually make your very own. Photo & Project courtesy of Decor Hacks. This is just one of many lighting tutorials online. There are various videos, tutorials, and styles to check out. 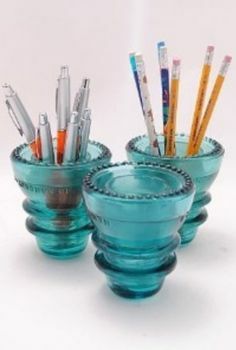 An easy, elegant way to organize pens, pencils, or even paint brushes. Photo via pinterest. To be honest, this is probably how I would end up using vintage glass insulators. I have tons of books and always in need of cool bookends. Photo courtesy of Pinterest. I am in love with these industrial lamps from the etsy shop luceantica. However, the price is not for everyone (including me). I did find a wall-sconce hack that can get you started over at Instructables. I have no idea how one would go about making this a reality, but with the holidays just a few months away there is always plenty of time to make this a reality if you wish. Photo courtesy of Dishfunctional Designs.